Love it. Works really well and is pretty easy to clean. Need to order another one soon. I love uni filters I have them on all of my toys. Came with a dual stage for my 2016 rzr. Make sure to use filter oil . Great filter, picked this filter up for my sons kfx 90 because the stock one was completely tarnished, he has ran this filter for quite some time now through snow, sand, light mud, etc. cleaning is quick and easy. THANKS UNI FOR A GREAT DURABLE FILTER!!! Uni filters and products work well for my Honda, have used them for years and always happy with them. High quality filter. Excellent fit and durability does it’s job keeping the dirt out! ... decided to revisit these. They're good but lining up the two filters with the cage pins is not as convenient as with the Twin Air's single. I dunno... I think I'm gonna just stick with Twin Air. I like it alright. No problems with it. I keep it clean. Probably will try the Twin Air next. Installed multiple Uni air filters in all dirt bikes and ATV's I work on and the equipment I own as well! I replaced my stock air filter on my 2012 XR 650L with the Uni and what a difference it made. Strongly recommend if you are looking to make more power and want to keep the reliability. You will need to clean it once a year I find. Much better than the stock filter if you plan on doing a lot of off-road with mud and dirt. Stock filter can be cleaned compared to the uni. Fit was 100% I’d recommend to anyone. Uni and no toil make the best air filters in my opinion. Great air filter for any machine. The filter installs like original and fits perfect. Easy to work with. Have been using Uni filter on my machines for years. Can’t say enough good things about them. Great filter. Love the base. I bought this for my Kawasaki Prairie. It is real similar to the TwinAir filter, but the Unifilter has a more solid base. It may not even need to be greased. So far, I've liked the filter. I have ridden in some atv groups on dusty roads and nothing has gotten by the Unifilter. Carb intakes are spotless. Really keeps the dust out! And it is a lot cheaper then the stock filter in the long run. I use these filters on all my machines and I have many. Highly recommend these filters. Great fit! Seals perfect in the air box! 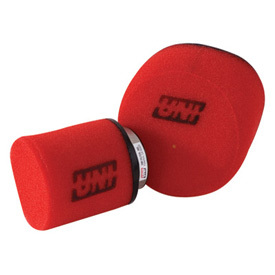 I have always used Uni on all my quad and bike they are so easy to clean and always fit good. I have never had problems with sucking dirt or water into my engine while running a Uni. Great price for what you get. Would recommended. Fits good, looks good, perfect for a quick swap out that won’t break the bank. Uni filter is my go to filter. They clean up easy and oil well. Performance is great. I use them on a CRF50, CRF70, XR400, and CRF250R and fitment is great. I've used these for years on many different rides. Hands down, these are the best powersport filters out there. They've consistently outlasted and fit better than every other brand I've tried, all while being one of the more reasonably priced options. Uni does it right every single time. I have always purchased this brand and I’m so glad that Rocky Mountain ATV/MC carries it .These filters work great in this fine Utah dust. Very happy. Like this air cleaner easy to clean and easy to service my 08 Teryx never ran so good. Improved air flow with better dirt filtering than stock or K&N type filters. Put it on my honda and right away it was pulling a little more power. It fits great over the paper air filter and should block more dirt than the stock one ever did. Great product. I already have one on the atv but I bought another for a backup. I cleaned my used one and it looks almost brand new. So I’ll just keep switching them out when it time to clean them. I bought one for every atv I own. very clean inside after desert rides. I love UNI air filters very tough. They clean up and look like new after every washing. Double filter design allows using continuously on long Dual sport rides with no worries. 2002 XR 400 UNI COMES WITH CAGE!!! Is it a direct fit or does it need a adapter? BEST ANSWER: On every bike we have had they have been a direct fit when ordered for that specific model. Most of our bikes are running the stock filter basket except my crf450 which has the aluminum Twin Air filter basket and the Uni ordered for stock application fit perfectly there too. I ordered this filter for a 2004 Yamaha Kodiak. The filter included the foam filter and pre-filter elements. I had to use the original rubber and wire filter supports that mount the filter. The filter has performed well with no issues. Make sure you use the drop down menus on the RMATV website for your specific application. Mine was a direct fit for my application. If you have any questions, call RMATV as they are helpful and knowledgable. I Got one for my 09 raptor 700 and it was the stock replacement. It did not fit on my mount which is a pro design. Couldn't find one with the rubber housing to fit so I had to go with a k&n. It should be a direct fit item if they have a listing for your motorcycle or ATV. Don't forget to order some filter oil too. Nope. No need for adapter! Just apply choise of filter oil and rim grease. Fit inner and outter filter togethr and mount. The UNi filter was a direct fit on my DRZ400E. It used the stock filter frame and fit right over it. My experience with Uni Air Filters is that they are a perfect match for my bike. The uni air filter was a direct fit for a 2012 polaris sportsman 500 h.o. I have a 2009 KLR 650 and it is a direct fit. Direct fit, but thicker foam than stock. Someone took the factory filter off of my 1998 kawasaki lakota 4 wheeler and I need the filter to hook directly to the carburetor. Will it fit like that? BEST ANSWER: No, this filter is designed to fit in your factory air box. There are universal filters available that you may be able to measure the dimensions you need though. BEST ANSWER: Yes, they're the same filter. It will fit 1999-2008 TRX400EX, 2009-2014 TRX400X, and 2004-2005 TRX450R. Does this filter do good on dirt roads? BEST ANSWER: Yes, this is a great filter for off-road machines. Are the dual layer filters glued/bonded together or separate? BEST ANSWER: I can separate mine. In others words they are two different pieces. Separate but glued together at the seams and mounting flange. They are 2 separate filters, 1 on top of the other. does the pre-filter need oiled? BEST ANSWER: If they need oiling the oil comes with it if I'm not mistaken. Yes these filters need to be oiled up before using. Yes they are shipped dry. What micron does it filter down to? This answer is correct, it's stated by Uni Filter in their catalogue on page one and in various promotional materials. I do not know the micron rating for this filter. I do know that if oiled correctly, it will stop very fine dust. I've never found any signs of dust down stream of the filter. Not sure about micron size but, I do know that these filters do a great job keeping dirt out if oiled properly. I recommend Maxima fab1 for filter oil. Zero Micron, the properly oiled foam filter will not allow anything to pass through. Will I need to dyno or tune for this filter. I have a 03 400ex? BEST ANSWER: No this filter is a direct replacement but it does come un-oiled so make sure you oil it before use. I didn't change anything on mine . Just install and go . No, it's essentially a factory replacement. Just drop it in and go!!! Can this filter be used as a filter for the clutch? BEST ANSWER: If it matches the intake tube size. I would clean the oil from the filter so that it will not lube or attack the belt system. The system most likely does not have the negative pressure overcome the filter being coated by fine particles which would stick to the oil, but not harm the belt system. The finer dust would blow through as normal, but the bigger coarser debris would be blocked. The clutch doesn't have a filter on the bike that I ride or any others that I know of. No, this is an air filter meant to mount to the intake of your bike. No. It's a intake air filter for the carb. Why are you riding? Is this a direct bolt on replacement of the stock air filter on a 2003 Rubicon or do you have to use the metal cage from the original filter? BEST ANSWER: If your stock filter has the metal cage then you will need to use that metal cage as well. The cage provides shape and support for the filter assembly so you can attach it tightly to the airbox. You must use it. It was a direct fit in the stock air box for my 2002 rubicon. It should be a direct replacement. It was for my Polaris. Does this filter require the stock filter cage? Yup, it wraps around the old cage. It would not be stiff enough without one. Yes it will require a cage. BEST ANSWER: uni filters use your stock filter cage. once in a while they will come with a cage built into it for example on an XR600/XR650. Do you mean the filter cage? For what bike? I bought the twin air kit for my XR650L. Can i use k and n #99-5000 air filter cleaning kit on my uni air filter? BEST ANSWER: The K & N Recharger Kit 6.5 oz Oil, 12 oz Cleaner is only to be used on K&N filters. I'm sorry for the inconvenience. You can use the cleaner on the filter, I use it, but don't use the oil it's too thick and will cause more restriction. Any word on when Rocky Mountain will have the new UNI filter NU-3271ST for the 2018-2019 Yamaha Wolverine X4/X2 models in stock? BEST ANSWER: We currently do not have any information on when we will have this. I apologize for the inconvenience. Will an air filter from off of a 2004 yamaha yfz450 atv fit onto a 1999 honda foreman 400 4x4 a tv? Will this fit my 2018 yfz 450r ? BEST ANSWER: No, you will only get one filter. Does this come with the inner canister for a 400ex? BEST ANSWER: No it doesn’t, you have to reuse the oem cage. Does this fit my 07 Suzuki ltr450, currently has a mod quad intake with kn&n. 3 1/2 in diameter ??? BEST ANSWER: Sorry, don't know about your Sazook but it fit my 07 Polaris Sportsman 500 just fine. Works great! Will this fit on a 1997 xr400r dirt bike ? Does this filter come with the high flow plastic cage? BEST ANSWER: No, this will only be the air filter. I am planning to get this filter. I run airbox lid off. Do I need to get an outerwears cover or can I run it as is? BEST ANSWER: You don't have to have an Outerwears cover, but if you don't have any other sort of filter protection, I'd recommend running one. This is going a Kawasaki KSF 50, the current filter housing bolts to the back of the carb. The carb barrel is not round. How will this filter attach? For a 2003 Honda XR50 it states it is a stock replacement but shows pics of the tube shaped one that attaches to end of carb, just trying to verify before I purchase? Thanks! BEST ANSWER: This picture is generic and doesn't necessarily represent the actual product you will receive. If your machine is listed in the drop down menu, you will receive the correct one for your machine. Will this fit a 2013 kawasaki klr 650? BEST ANSWER: To see if this part will fit your machine please enter the make, model, and year into our "Choose a vehicle" drop down boxes found above the product image. If your machine is not listed, we may not carry the right item for your application. 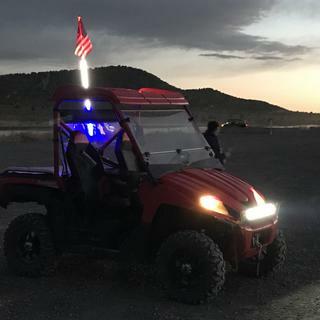 Which filter for a Tao Tao Bull 150 atv? Does this filter come with the holder element or is there one built inside? BEST ANSWER: It depends on the application. If it's a clamp on filter it will include the holder. If it is a standard filter that fits over a cage, then it will not include the cage, only the foam filter. I just got a kx80 with a uni filter on it , do I need to oil both inner & outer filters or just one or the other? BEST ANSWER: All foam surfaces need to be oiled to be the most effective. does it come pre oiled? BEST ANSWER: No, it does not come pre oiled. Hi, does the uni filter fits my can am ds 450 2015? Thank you. BEST ANSWER: I checked into this for you and this will fit the 2015 Can-Am DS 450 X MX and the DS450 X XC models. But it we do not have it listed to fit the DS 450.